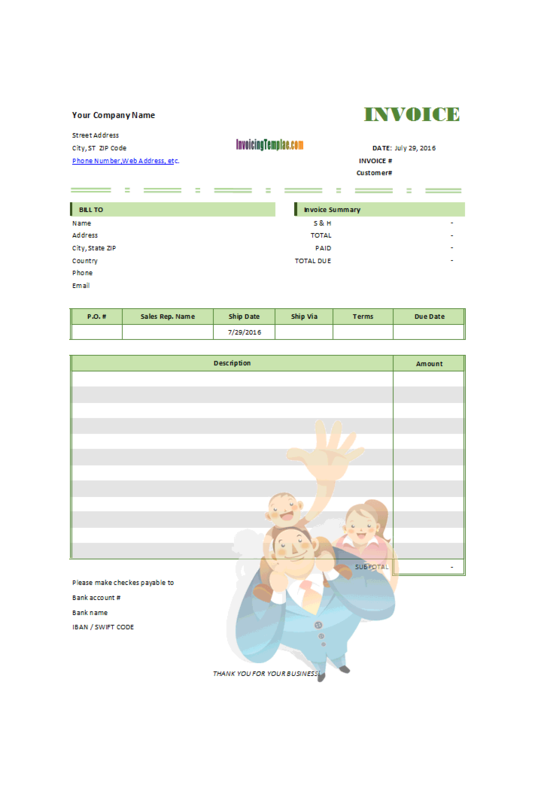 If a simple payment receipt is not enough for your daycare business, this free blank daycare invoice template in Microsoft Excel "xlsx" format offers an itemized and detailed form for your daycare / babysitting home or small business. 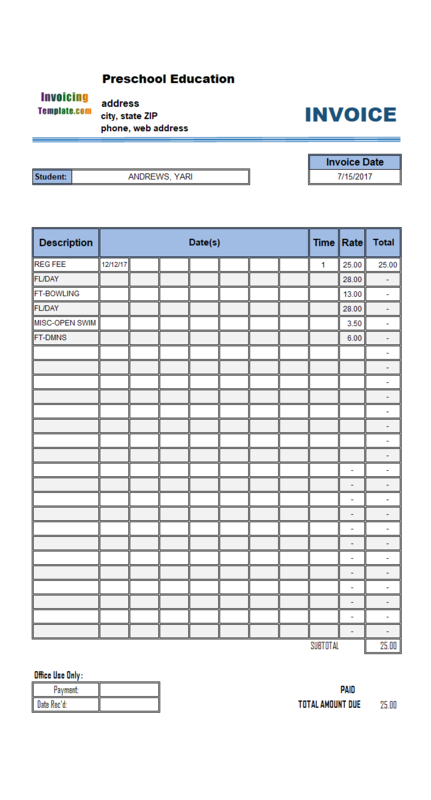 c5080 now includes the customized invoice template for the latest version of Invoice Manager for Excel. This is what you will see when you open daycare.xlsx. 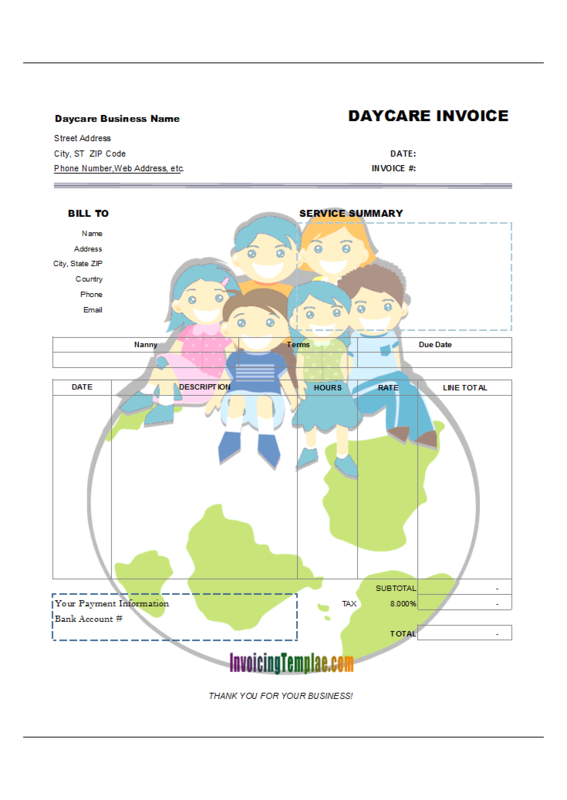 This free child care invoice template is printable on standard letter 8.5 X 11 inch paper size. 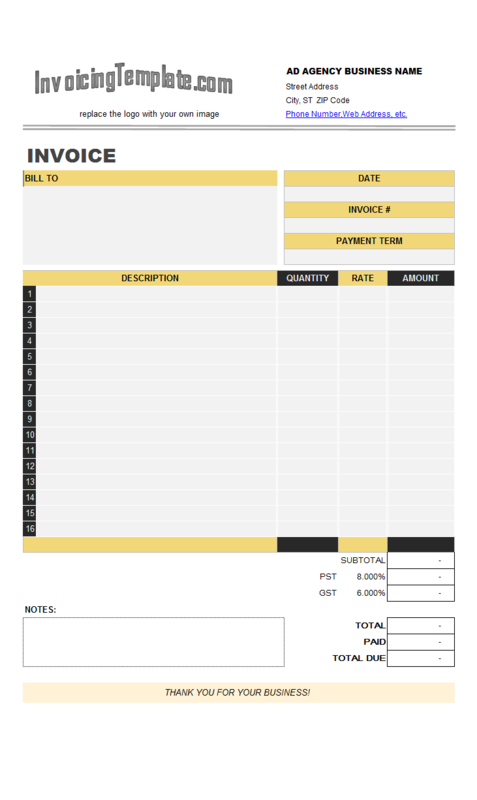 Like the other downloadable invoicing forms here on InvoicingTemplate.com, this template is too created from the default bill template shipped with Invoice Manager for Excel (namely Uniform Invoice Software). 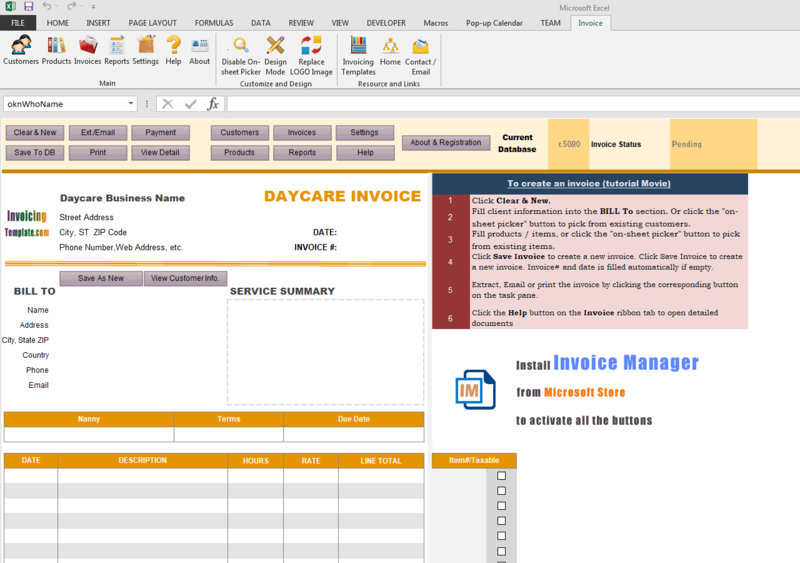 This make sure that the Daycare Invoice Template works well with Invoice Manager for Excel (namely Uniform Invoice Software). 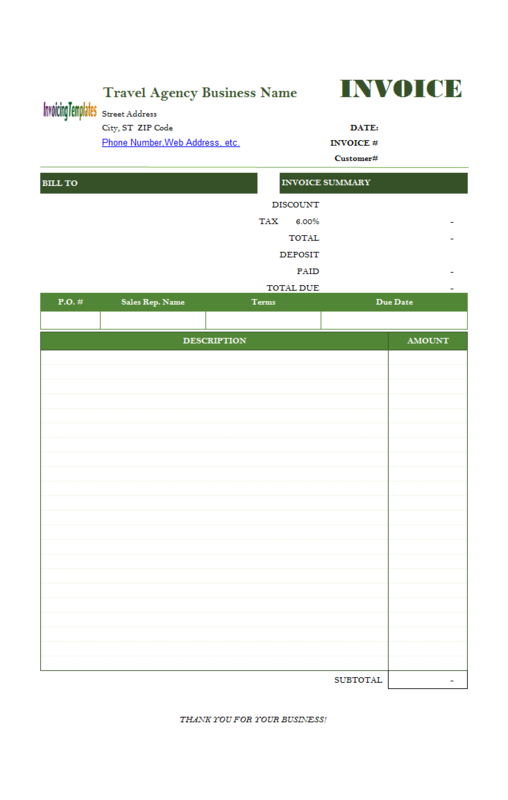 Once you've installed this template with Invoice Manager for Excel (namely Uniform Invoice Software), which is our offline invoicing software that works with Windows desktop PC running Windows XP, Windows Vista, Windows 7 / 8 / 10 and Microsoft Office / Excel 2003, 2007, 2010 and 2016, Invoice Manager for Excel (namely Uniform Invoice Software) becomes a professional daycare invoicing software app. 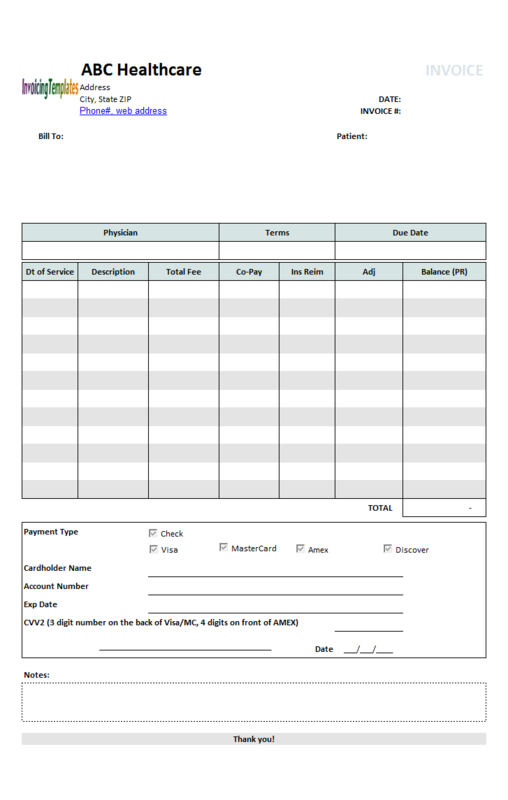 Read on to find more tips and guidelines for daycare invoicing and billing. Next to the logo image is your own daycare business information. Enter your business name like Missouri Child Care and address, contact information. If you have any licenses obtained for child care service, note the fact here to let the parents know that you are offering professional daycare and babysitting service. As per your local taxation office requirements, you may also need to show your tax # (or VAT#) here. 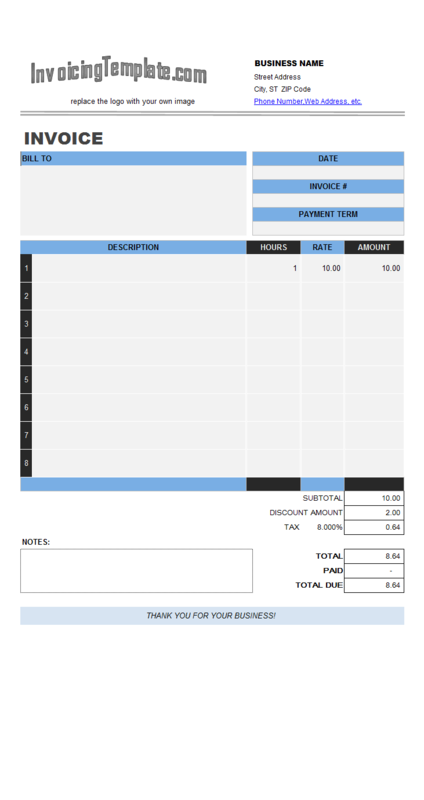 On the top-right corner you'll see the Invoice# and Invoice Date fields. 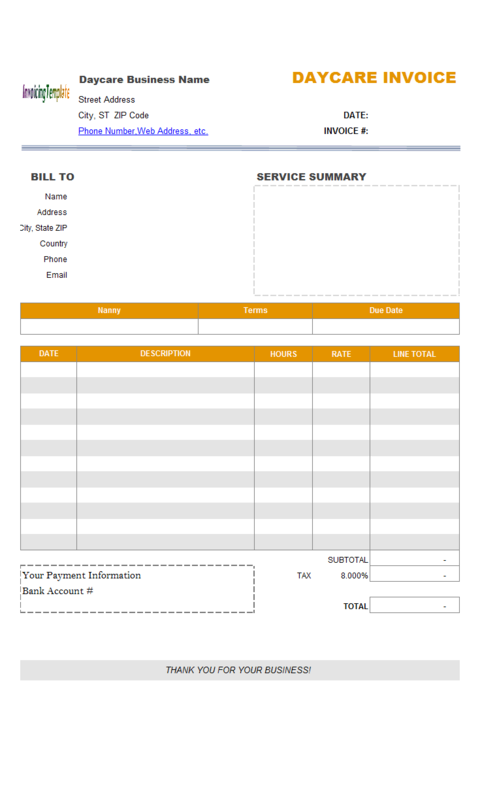 These are two important fields for a professional invoice. 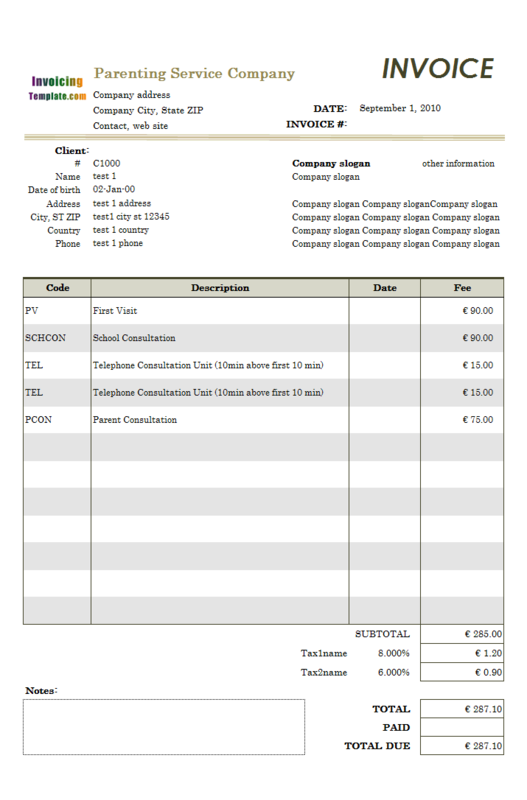 The invoice# is a unique serial number. 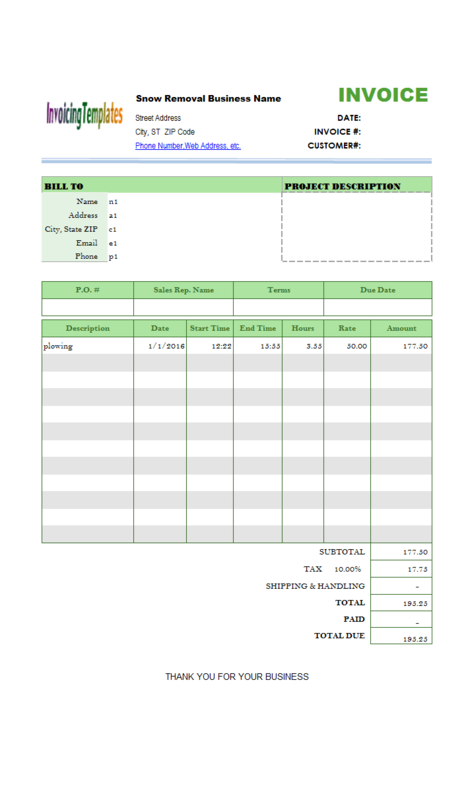 The numbering of invoice# could somewhat be a problem if you use this pure-Excel template. 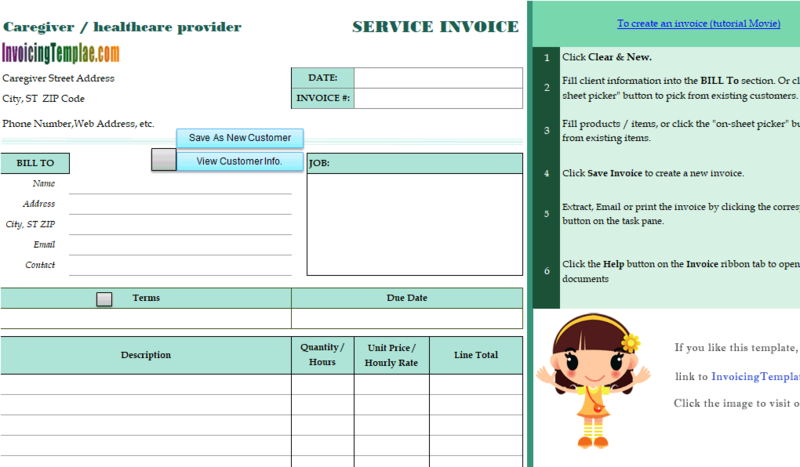 Invoice Manager for Excel (namely Uniform Invoice Software) can help you generate the invoice# numbers based on the sequences stored internally in a database - when you create an invoice, click the "Save Invoice" command to have the daycare invoicing system generate the invoice# for you. Underneath the "Bill To" section, you'll find fields for "Nanny", "Payment Term" and "Due Date". The payment term fields allows you to choose a suitable term from a list of terms by clicking the in-cell lookup button created by Invoice Manager for Excel (namely Uniform Invoice Software) app. 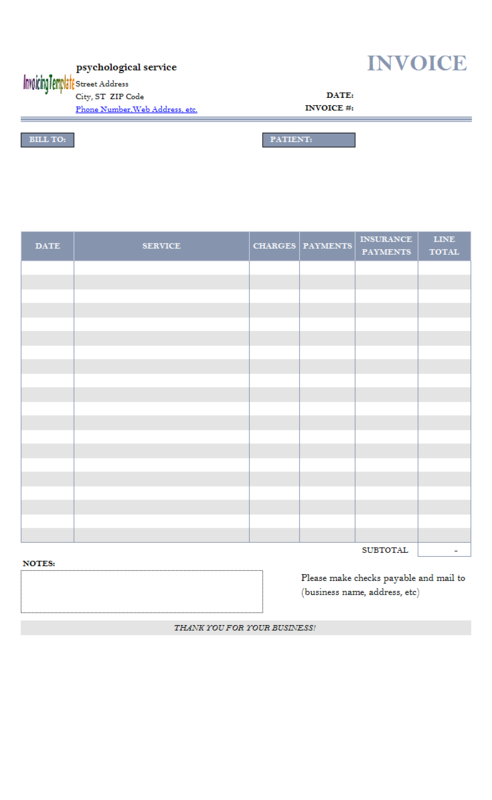 The detail section on this form includes 5 columns - "Date", "Description", "Qty", "Rate" and "Line total". This design is intended for commercial child care facilities, home and private daycares, babysitting, nanny services, allowing to charge for child transportation, meals, education, etc. 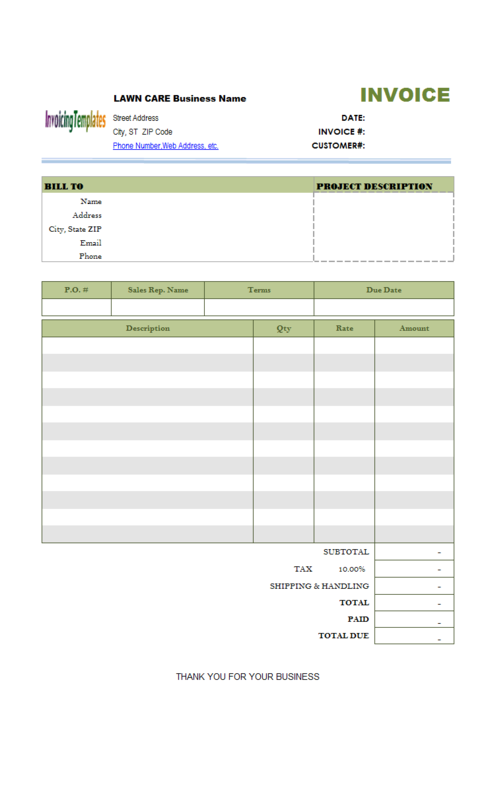 On the bottom of the form, the template calculates subtotal, total, taxes for you. There is also space for you to detail your bank account and other payment information. 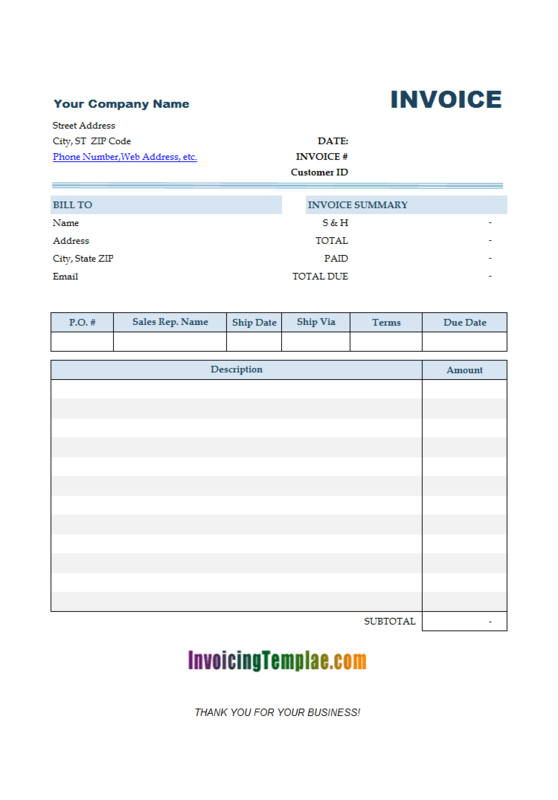 If you have Invoice Manager for Excel (namely Uniform Invoice Software) installed, the invoicing software program also helps you to manage your account receivable and generates reports for you. Feel free to download the fully functional trial version and see how it works for you. 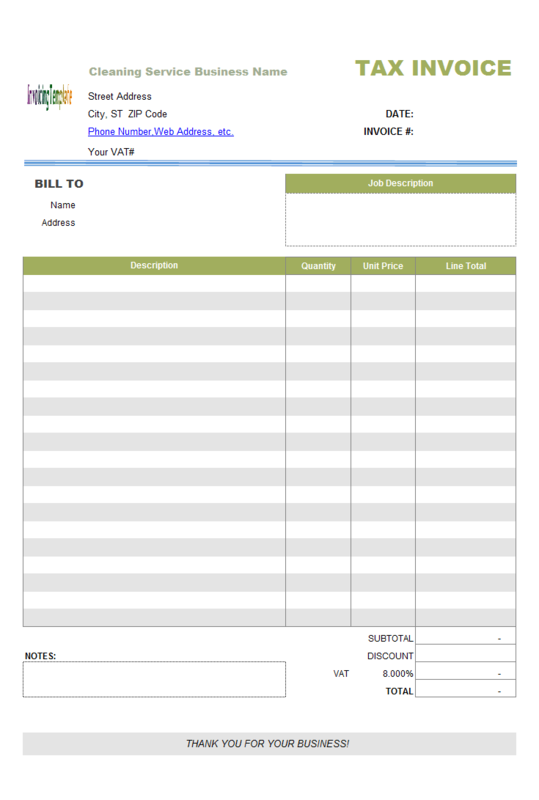 Like other form designs here on InvoicingTemplate.com, Child Care Billing Format is free (offered to you at a price of 0.00USD). It works on Windows XP and all newer versions of Windows, and Excel 2007, 2010, 2013 or 2016.